In June 2010, Rayo Vallecano were asked by a judge to pay Álvaro Zazo for breach of contract. After being removed from the team the previous summer, Zazo denounced the club. He was training with Córdoba at the time. The player, who sued for 600,000 euros, received two-thirds of the amount. But now, Zazo is just as well known for being unemployed for long periods of time - on 15th March 2015, after nearly eight months without a club, he signed for Real Avilés in the Segunda B. And on 11th January 2017, following almost two years of inactivity, Zazo joined UD San Sebastián de los Reyes in the Segunda B as well. "Trotamundos del fútbol de Segunda División B", they called him. Born in Madrid, Zazo played in Real Madrid's cadete and juvenil teams, and finished his formation with local Las Rozas. He made his senior debuts in the 2002-03 season with Toledo, in the third division. A year later he joined Mallorca B for a two-year spell which ended with relegation from the Segunda B. In the 2005 summer, Zazo signed with Fuenlabrada, scoring twelve goals in his first and only season. This earned him a move to neighboring Rayo Vallecano also in division three, where he began suffering heavily from injury problems. In the summer of 2007, he suffered a rupture of the anterior cruciate ligament of his left knee which caused him to miss the entirety of the 2007-08 season. A loan move to Lorca Deportiva on loan (2008-09) saw him pop up with seven goals, but he was "de-registered" i.e. removed by Rayo in 2009. He would spend the first half of 2010 with Córdoba on trial, but nothing came out of it and in July 2010, Zazo signed with Leganés. He left after one sole season, and joined Tenerife also in the third tier. 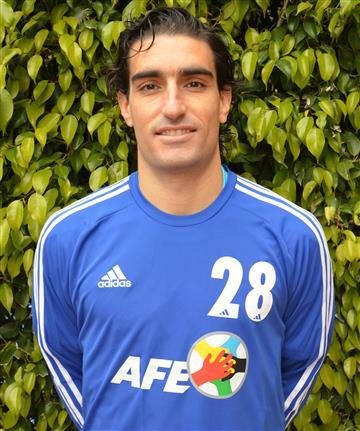 On 9 July 2012, Zazo signed with second division side Guadalajara. He made his debut as a professional on 19 August, playing the full 90 minutes in a 1-1 away draw against Alcorcón. However, in September, he suffered another knee injury which kept him out of action for six months - he was back in mid-May of 2013. Therefore, Zazo appeared in only six matches as the Castilla-La Mancha team was relegated, and renewed his contract on 15 August 2013. He left the following summer. On 15 March 2015, after nearly eight months without a club, he signed for Real Avilés - nine games later the club were relegated from the Segunda B and Zazo was without a club again. For almost two years that is - on 11 January 2017, Zazo joined San Sebastián de los Reyes in division three. Before joining, and after leaving, Real Avilés, Zazo was playing for Sesiones AFE. The Association of Spanish Footballers (Asociación de Futbolistas Españoles or AFE) created the team specifically to reintegrate professional footballers who, for various reasons, have been left without a professional team. It includes playing friendlies with La Liga, Segunda and even foreign teams, medical and nutritional checks, and social activities. And just rummaging around, you can find some amazing names - Sergi Barjuan coached there between his managerial stints at Barcelona juvenil and Recreativo. David Aganzo played there between his stints at Hércules and Aris - he was without a club at the beginning at the 2012-13 season. Nagore defied all the odds and made his La Liga debut at 33 in January 2014 - Levante had signed him as a replacement for Christian Lell. And yet as early as summer 2015 left Alcorcón in the Segunda and was playing for them before getting a contract at Huesca. And yes, that is the same Nagore who started in the 4-0 win over Real Madrid. He nearly scored too - a deadly cross from the right-back found the post, the goal-line but not the goal.